Hysterothylacium is one of the most important nematode parasites parasitizing fish, and it's the most diverse species nematodes of marine parasites, these species attach to the intestinal wall via their mouth lips adaptation. In the present study, seven out of 56 fish specimens (12.5 %) were found to be infected by the adult worms of Greasy grouper fishes Orangespotted grouper Epinephelus coioides (Forsskål, 1775)from locations of marine coastal water, Arabian Gulf, Iraq. A new recorded of Hysterothylacium spp. collected are morphologically described, genetically and Sccaning Electron Microscope (SEM) images for new systematic observations, on dorsal labium, sub ventral labia, posterior end of a the female and the male. Based on the study of the gene sequencer data and SEM images, it will be suggested that species are H. persicum. The study provides us some data on the taxonomy of these parasites in the Arabian Gulf. The gross examination of the fish's intestine food items and the Relationships of fish length, In this study showing that the length ranges for adult infected were 25-45 cm long, and the major food items found in the stomach were a Largest group of miscellaneous of fishes length more than 25 cm , whereas crustaceans miscellaneous parts of animal body, i.e. appendages, chela, parts of the carapace of crustaceans were found in stomachs in all the month including except some of them in stomach of length less than 20 cm , it was clear that the 25-45cm ctotal length feed mainly on fish that explain fishes are the second intermediate host of IV larval stage of nematodes. In the present reported can consider that the Epinephelus coioides as a new host for Hysterothylacium persicum and a newly recorded in Iraqi marine water . 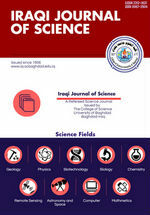 The aim of the current study is to diagnose and study new species of parasites that belong to the genus throughout the morphological studies along with the image data selected for SEM and sequence and combined with the other species of Hysterothylacium that reside in the Iraqi marine water and the relationships of fish length, food items and parasite infection. Hysterothylacium persicum --- Nematoda --- Orangespotted grouper Epinephelus coioides (Forsskål --- 1775) fish --- Iraqi marine waters. Five isolates (25%) of Klebsiella pneumoniae were isolated from urine samples. In addition also isolated bacteria were (10) 50% Escherichia coli, while (3)15% Proteus spp., (2)10% Pseudomonas aeruginosa. The ethanolic extract of Cinnamomum zeylanicum bark were tested against Klebsiella pneumoniae by using the well agar diffusion test, the alcoholic bark extract from (200 -12.5) mg/ml possessed antimicrobial activity against tested microorganism. At 200 mg/ml, and 100 mg/ml concentrations was diameter of inhibition zone rang from (18-26mm), (14-16mm) respectively, and these results compared to antibiotics Norfloxacin(10µg) inhibition zone (24-30mm), and Cefotaxim (10 µg) (26-27mm) as control. Antibiotics sensetivity were used ten antibiotics with disc diffusion method against K. pneumoniae, they were sensitive to Cefotaxime, Imipenem /Cilactin,Sparfloxacin, and Norfloxacin antibiotics only, and were resisted to the others antibiotics. Minimum inhibitory concentration was tested for plant extract, and was ranged versus Klebsiella pneumoniae (12.5-25) mg/ml. It could be concluded that alcoholic extract of Cinnamomum zeylanicum had a good antimicrobial effects and anti-biofilm on Klebsiella pneumoniae with significant difference (p< 0.05). This caused a decrease in the biofilm of the tested bacteria. Hence, it may be used instead of antibiotics to treat UTIs caused by bacteria used in current study. In this Research, (In2O3: CdO) films were prepared using pulsed laser deposition (PLD) method on glass substrate at room temperature deposited at laser influence 500mJ/cm2with different shoots N= (200,300,400,500and600). the structural, and the optical properties and the films are studied with different annealing temperatures (523and 623) K. Optical measurements and the films were analyzed by UV-VIS absorption spectra. The structural properties of samples were investigated by x-ray diffraction patterns of the films and show that the films and polycrystalline Structure with all shoots. Transmittance spectrum found is equal to 93.17%, refractive index range is 1.635 and energy gap range is 2.75-3.15ev. In this paper, a polymer-based composite material was prepared by hand Lay-up method consisting of epoxy resin as a base material filled with by magnesium oxide powder once and silicon dioxide powder again and with different weight ratios (3%, 6%, 9%, 12%). The three-point bending test was performed in normal conditions and after immersion in sulfuric acid. The results showed that the bending value decreased with the increase of the weighted ratio of the filled nano powder (MgO, SiO2) .The Bending of samples filled with by SiO2 was found to be less than the bending of samples filled with by particles (MgO), the bending of the SiO2 sample (0.32mm) at the weighted ratio (3%) and for the MgO (0.18mm) sample at the weight ratio were the same at the same weighted load (100 g). It was found that the bending values of all samples exceeded the value after immersion in sulfuric acid. The percentage of weight (6%) at the load level (500 g) was changed from 1.16mm in normal conditions to 1.48mm for the same weight ratio after immersion. In sulfuric acid diluted with 0.3N for 10 days at the same Applied load. Petrel is regards one of the most important software to delineate subsurface Petrophysical properties to the reservoir. In this study, 3D Integrated geological models has been built by using Petrel software. The process includes integrated Petrophysical properties and environmental approaches. Noor oil field within Mishrif Formation in terms of structural geology represents asymmetrical anticlinal fold with direction NW-SE. Porosity and water saturation model have been built. The reservoir was divided into several reservoirs and Non-reservoir units depends on the Petrophysical properties for each zone. In addition, intact model for the reservoir in terms of porosity and water saturation have been built. MB reservoir unit represents the most important oil bearing unit according to the high porosity and low water saturation are present in this unit. MB reservoir unit in terms of Paleoenvironment which represent the shoal including rudist biostrome. Rudist biostrome buildups comprise the major oil producing reservoirs in the carbonate strata during Cretaceous Period. 3D geological modeling --- Mishrif Formation --- Noor oil Field. Five traverses 2D resistivity survey and 20 Vertical Electrical Sounding (VES) points were carried out on Ile Epo Dump Site with a view to inferring the extent of migration of leachate plumes in the subsurface for possible contamination of groundwater. The surveys were carried out with Omega model resistivity meter. The Schlumberger configuration was employed for the VES while Wenner configuration was employed for the 2D resistivity survey (Constant Separation Techniques). The obtained VES and CST data were interpreted using WinResist and DIPRO respectively. The integrated results revealed three to four geo-electrically polluted materials as highly saturated fills (less than 15 Ωm, 1.9 – 27.4m), saturated fills (15 - 30 Ωm, 3.6 – 29.9m) and unsaturated fills (30 - 70 Ωm, 8.1 – 37.1m) underlain by sand formation. The resistivity values of the highly saturated zone mostly did not exceed 7 ohm m as appears in figure 3, 4, 5, and 6. A good correlation was established between the thickness of the different fills delineated from the VES and CST results to a depth of 30m. Based on the integrated geophysical investigation, it is therefore concluded that aquifer units within and underlying the sand layer around Ile Epo Dumpsite and environs are potentially polluted. However, for groundwater exploration, aquifers at deeper depth are likely to be free from contamination but required time to time monitoring because the underlying sand layer serves as possible migration path to the pollutants, thereby contaminating aquifers within underlying sand layer. Mapping groundwater quality Index for irrigation is of great importance for agricultural issues. As groundwater is a vital source of water for domestic and agricultural activities in Iraqi Western Desert area, where the study area (Dibdibba aquifer) represents the extreme eastern part of it, evaluation of groundwater quality and its suitability for irrigation is important. This study aims to develop decision support tools for identifying the optimal locations of groundwater regarding its quality to meet the future demands of the study area. Samples were collected during the wet season (April-May 2017 (and analyzed for determining the physicochemical properties. The indices used in the quality assessment were the sodium adsorption ratio (SAR), sodium percentage (%Na+), magnesium hazard (MH), and irrigation water quality index (IWQI), incorporating the spatial variation using the GIS-based multi-criteria system highlighted the spatial variation of groundwater quality for irrigation in the study area. This spatial distribution indicated that groundwater is generally of moderate quality in the Dibdibba aquifer. The Kumait Oil field was interpreted using 3-D seismic data from Oil Exploration company. The Shuaiba Formation (Cretaceous Age) reflector is detected.Structural map of formation is prepared to obtain the location and direction of the sedimentary basin and shoreline. Depth maps was drawn depending on the structural interpretation of the picked reflector and show several structural feature as closures.The seismic interpretation of the area approves the presence of some stratigraphic features in the studied formation. Some distributary mound and flatspot were observed within the study area, but they are not continuous due to the tectonic effects. These activity elements give reasonable explanation for the hydrocarbon distribution in the area of study and explain the cause of wildcat of Kt-2 is well. This research focused up on the Seismic reflection study of a 268.7 km2 area located in the central of Iraq within the Karbala province (Kifl area). The seismic data were reprocessed by Anadarko Petroleum Corporation and its partners Dome International and Vitol with OEC in 2005, the result of processing works has improved the quality of seismic sections in most of the study area. The study area was interpreted by using 3-D seismic data from the Oil Exploration Company. By studying the seismic sections and applying seismic attributes (instantaneous phase) Faults were picked across 3D seismic volume of the studied reflectors. The study area affected by a major fault and minor normal faults, Two fault system has been observed in the study area; the major normal fault of (NW-SE) trending and minor normal faults of (NE-SW) trending, with a small displacement are influencing the studied reflectors (NahrUmr, Shuaiba, Zubair and Ratawi reflectors). Time, velocity and depth maps are prepared depending on the structural interpretation of the picked reflectors, The structural interpretation of these reflectors shows a structural anticline (Asymmetrical anticline) extending in NW-SE trend and plunges to the southeast with a dip angle about 5 degrees. and the general dip towards the east. Emerge application was used in Hampsson-Russell programs and that uses a combination of multiple 3D or 2D seismic attributes to predict some reservoir parameter of interest. In this research used the seismic inversion technique was performed on post-stack three dimensions (3D) seismic data in Nasriya oilfield with five wells and then used this results in Emerge analysis (training and application) were used to estimate reservoir properties (effective porosity) with multiattribute analysis derive relations between them at well locations. The horizon time slice of reservoir units of (Yb1, Yb3 and Yc) of Yamama Formation was made for property (effective porosity) to confirm match results and enhancement trends within these units. Because of the good prospects of the oil in the rocks of Cretaceous generally and Yamama Formation specially in the Nasriya oilfield and in view of the economic importance of Yamama Formation, which is considered as important formation that contains hydrocarbon accumulation, and one of the most important and oil production reservoirs in southern Iraq. The aim of this paper is to introduce and investigate new subclasses of regular functions defined in U. The coefficients estimate|a_2 |,|a_3 |and |a_3- a_2^2 | for functions in these subclasses are determined. Many of new and known consequences are shown as particular cases of our outcomes.